Brenner: Do you always hold hands with suspected stalkers, pointy-hair? Integra: I am not holding hands with you, creep! And quit calling me that ridiculous nickname! Brenner: Well, you always call me “creep,” so it’s only fair. Let’s make a deal. I’ll call you by your real name, and you call me J. H. Brenner. How about that? 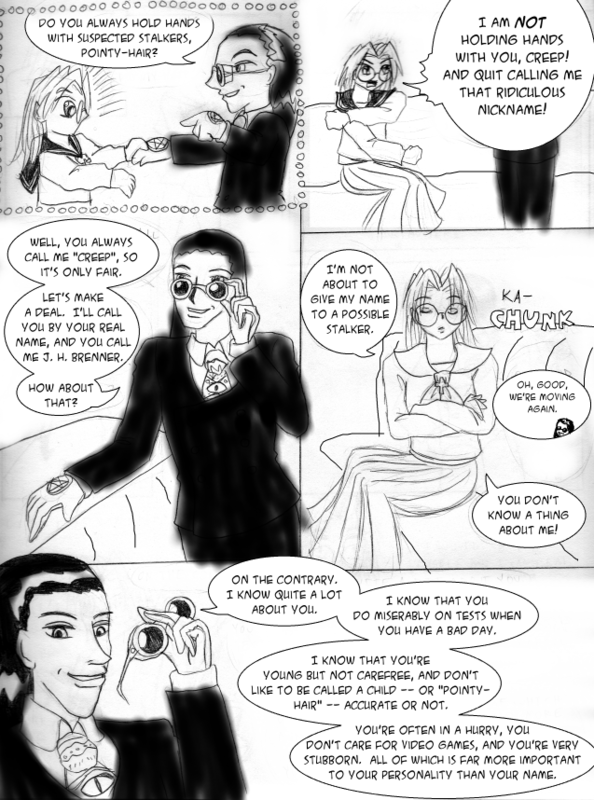 Integra: I’m not about to give my name to a possible stalker. Brenner: Oh, good, we’re moving again. Integra: You don’t know a thing about me! Brenner: On the contrary, I know quite a lot aobut you. I know that you do miserably on tests when you have a bad day. I know that you’re young but not carefree, and don’t like to be called a child — or “pointy-hair” — accurate or not. You’re often in a hurry, you don’t care for video games, and you’re very stubborn. All of which is more important to your personality than your name. Pip: Oh, come on! A vampire paper user? That’s cheating!